Lew Barnes was an Oregon Duck during his college days from 1983 to 1985. A consistent receiver with blazing speed, Barnes posted 117 receptions for 2048 yards, a 17.5 yards per reception average, and 18 TDs over his time in Eugene. Lew is notable, as he was the only Oregon All-American named on offense between 1971 and 2007. 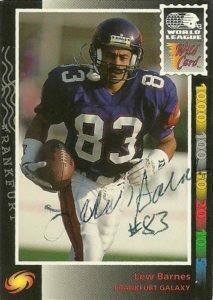 At the time of his graduation Barnes was the Ducks all-time leading receiver. He was drafted in the 5th round of the 1986 NFL Draft by the Chicago Bears. The Bears, well, they were hard on their receivers and the Super Bowl Champions were through and through a running team. Lew faced an uphill battle making the squad, but was fortunate. As starting return man Dennis McKinnon underwent his 3rd knee operation- the Bears needed a punt return man and it just so happened that Barnes fit the bill. Lewis made the best of his single season in Chicago. He led the league with 57 punt returns (482 yards), and returned a kickoff 85 yards for a TD. Barnes broke his left leg during the preseason in 1987 and spent the entire year on IR. The following year in 1988, he got cut during the preseason- only a few days after a 97 yard kickoff return TD got called back over a questionable illegal block against the Cowboys. While the Bears really liked Barnes, he got caught in a numbers game, especially with rookie wide receiver 1st round pick Wendell Davis in camp. Barnes quickly landed a job with the Falcons, reuniting him with former Duck QB Chris Miller. He’d play in 13 games, and post solid numbers again on punt returns, with 34 for 307 yards, including a 68 yarder, but not see any time at receiver. He’d then play 2 games in 1989 with the Kansas City Chiefs. 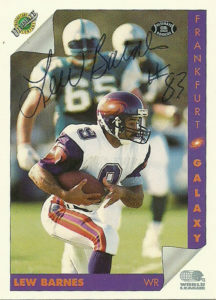 Lew decided to play for the WLAF in 1992. He’d be selected by the Frankfurt Galaxy. During his lone season with the franchise, Lew led the team in yards from scrimmage. He’d be 3rd in receptions with 24, but second in yards with 402 and a guady 16.7 YPC. Lew also was counted on for special teams duty, posting 198 yards on 10 kick returns, and 46 yards on 11 punt returns. He’d help the franchise win the division and reach the playoffs for the first time in history, before the league went on hiatus. Lew had two spectacular action shots from Ultimate and Wild Card. Being that the Galaxy did not play ever in San Antonio, I never was even able to attempt to get any members of the franchise. With his place in Oregon and NFL history, I thought Lew would be easier to locate, but nobody had a whiff of him at all. It took me quite a few years, but after cross referencing a lot of data on Spokeo, I was able to find an address I was confident in and take a shot. He responded and wrote me a very nice note. With excellent cursive penmanship, he thanked me for writing him, and told me that he too had a great-great relative in his past that had my full name, and we could possibly be… related? Small world!